BACKGROUND AND PURPOSE: We can easily recognize familiar music by listening to only one or 2 of its opening bars, but the brain regions that participate in this cognitive processing remain undetermined. We used positron-emission tomography (PET) to study changes in regional cerebral blood flow (rCBF) that occur during listening to familiar music. METHODS: We used a PET subtraction technique to elucidate the brain regions associated with the recognition of familiar melodies such as well-known nursery tunes. Nonmusicians performed 2 kinds of musical tasks: judging the familiarity of musical pieces (familiarity task) and detecting deliberately altered notes in the pieces (alteration-detecting task). RESULTS: During the familiarity task, bilateral anterior portions of bilateral temporal lobes, superior temporal regions, and parahippocampal gyri were activated. The alteration-detecting task bilaterally activated regions in the precunei, superior/inferior parietal lobules, and lateral surface of frontal lobes, which seemed to show a correlation with the analysis of music. CONCLUSION: We hypothesize that during the familiarity task, activated brain regions participate in retrieval from long-term memory and verbal and emotional processing of familiar melodies. Our results reinforced the hypothesis reported in the literature as a result of group and case studies, that temporal lobe regions participate in the recognition of familiar melodies. From birth, we are exposed to numerous pieces of music. We listen to many of them only once or twice and then forget them. We listen repeatedly to other tunes. We memorize their melodies, lyrics, and titles and can sing some of them anytime and anywhere. These tunes are called “familiar music.” In the last few decades, some studies have indicated which brain regions participate in the recognition of familiar music. In case studies of amusical patients, or nonmusicians, impairment of the recognition of familiar melodies has been caused by bilateral damage of anterior temporal regions.1 The authors reported 2 patients who were unable to recognize melodies that were highly familiar to them before their brain accidents. Both patients developed infarction of bilateral anterior temporal regions, which contained the temporal poles. Only one report of a neuroimaging study of the brain areas involved in the recognition of familiar music seems to have been made.2 Using positron-emission tomography (PET) of nonmusicians, Platel et al2 investigated the activated brain regions during a familiarity task. They observed activation of the left inferior frontal gyrus, bilateral superior temporal gyri, left middle occipital gyrus, and the left anterior cingulate gyrus but not of anterior temporal portions. We performed a PET activation study of nonmusicians to clarify which brain regions, especially anterior temporal areas, participate in the recognition of familiar music. Agnosia is defined as impaired recognition of previously meaningful stimuli that cannot be attributed to primary sensory defects, attention disturbance, or a naming disorder.3 In visual processing, there is fairly general agreement that visual recognition could be disrupted either during visual perception (apperceptive agnosia) or during the process of associating the percept with meaning (associative agnosia).3 According to this hypothesis, Peretz proposed a model of cognitive processing of melodies with 2 hierarchical stages.4 First, at the stage of perceptual analysis, auditory input was perceived being divided into temporal and melodic organization. Temporal organization contained the information of rhythm and meter, and melodic of pitch and contour. At the representation system, these 2 kinds of information were integrated, and, then, recognized. The author did not mention the product of the integration, and we named that a “melody-image.” “Melody-image” is defined as the internal imagery of the melody. The term of “image” means a way of capturing the organization inferred from patterns in concept formation.5 Based on this hypothesis, let’s think about the mental processing of listening to familiar music. When we recognize familiar melodies, the music might be compared with melodies that are stored in long-term memory (LTM).6 Through the stage of perception of auditory stimuli, a melody-image is formed. Then, melodies in the LTM are retrieved and compared with that melody-image. We hypothesize that during recognition of familiar melodies, brain regions that participate in generation of the melody-image and retrieval of melodies from LTM would be activated. We also propose that linguistic information, such as titles or lyrics, possibly have a relationship to the recognition of familiar melodies, and activation would be observed at the cerebral regions that are involved in linguistic processing. Our experiment consisted of 2 kinds of cognitive tasks: judging the familiarity of a tune and detecting altered notes in the same melodies. We adopted these tasks for 2 reasons. First, in the subtraction technique for PET studies, brain regions that specifically participate in certain cognitive processing are identified by subtracting regional cerebral blood flow (rCBF) between different cognitive tasks. If the stimuli between tasks are not identical, as found in some literature,7–10 then a difference in the stimuli between tasks, but not the difference of cognitive processing, may cause different distribution of rCBF. Therefore, it is necessary to use identical materials to clarify the cognitive processing of each task independently. Second, it is recommended that in activation studies, the tasks at least partially have common cognitive processing. So by subtracting the rCBF of one task from the other, the brain regions that are commonly activated in both tasks will be annulled. The smaller the difference of cognitive processing between the tasks, the clearer the brain regions that specifically activate in each task. To judge the familiarity of tunes, subjects have to listen to each melody, retrieve melodies from LTM, and compare them. When there are altered notes in familiar melodies, we can easily distinguish them. In detecting those altered notes, melodies in the LTM might be retrieved, compared with the represented melody, and a judgment made as to whether each note is correct. Thus, both of these tasks contain common cognitive processing (that is, listening to the melodies and retrieving the same melodies from the LTM). For these reasons, we adopted the task of judging the familiarity of tunes and detecting altered notes in the melodies for the present study, by using identical auditory materials with a PET subtraction technique. Ten right-handed male volunteers (age range, 20–28 years; mean, 21.6 years) participated in the study. All subjects were students at the Schools of Engineering or Mining, Akita University, and met criteria for Grison’s second level of musical culture.11 None had received any formal or private music education, and none had any signs or history of neurologic, cardiovascular, or psychiatric disease. All subjects gave written informed consent after the purpose and procedure of the examination had been fully explained to them. The study was approved by the Ethics Committee of the Research Institute for Brain and Blood Vessels, Akita, Japan. All experiments were conducted in accordance with the Declaration of Helsinki. The stimuli in this experiment were 33 melodies, lasting approximately 10 seconds each. Of these, 27 melodies were well-known old Japanese nursery songs, and contained the whole or approximately half the length of each tune. In 24 of these 27 melodies, a part of each melody was purposely altered. The alteration consisted of a change of the pitch of a note and a change of the rhythm for 1 or 2 beats. Three of the 27 nursery songs were presented intact. The stimuli also contained 6 new melodies that were composed by one of the authors. The 33 melodies of the stimuli were divided equally into 3 groups. These melodies were played by using a Yamaha PSR-330 synthesizer set to piano-tone and recorded on a minidisk. All subjects performed the following 2 tasks during the PET measurements. (A) Familiarity task: subjects were required to listen to the melodies and judge whether each melody was familiar to them or not. (B) Alteration-detecting task: subjects were required to listen to the same melodies, and detect the altered notes of each melody. As indication of recognition, subjects were instructed to make a sign with the index finger of their right hand, if they regarded the melody as familiar in task A and whenever they noticed altered notes in each melody in task B. To avoid a repetition effect for judging the familiarity, task A was first performed for all melodies, followed by task B in the same order. All stimuli were presented binaurally via inset stereo earphones. The protocol used in this study has been previously described in detail.12,13 In brief, PET data were acquired in 3D acquisition mode by using Headtome V (Shimazu, Kyoto, Japan). Scans were performed with subjects lying supine with their eyes closed in a darkened room. Six CBF measurements were determined for each subject: 3 during the familiarity task and 3 during the alteration-detecting task. Using oxygen-15 (15O)-labeled water (H215O) intravenous bolus technique,14 emission data were collected for 90 seconds in each measurement after the intravenous bolus injection of 15 mL (40 mCi) of H215O. Each piece of music was started 15 seconds before data acquisition, repeated 2 times, and continued for approximately 120 seconds. Emission data were corrected for attenuation by acquiring 10 minutes of transmission data using a germanium-68 (68Ge) orbiting rod source performed before the activation scans. A washout period of approximately 10 minutes was allowed between successive scans. For anatomic reference, all subjects underwent axial T1-weighted imaging (T1WI) and T2-weighted imaging (T2WI) in a 1.5-T MR system (Vision, Siemens, Germany). T1WI (repetition time [TR]/echo time [TE] = 665/14 ms) and T2WI (TR/TE = 3600/96 ms) were obtained by using a section thickness of 5 mm with intersection gap of 1 mm. For behavior measures of the performance of the familiarity task, all subjects stated that the old nursery songs were familiar and newly composed melodies were unfamiliar. They immediately and easily recognized each nursery song as familiar after listening only to its first one or 2 bars. For the detection of altered notes, subjects demonstrated approximately 90% accuracy in their responses. They concentrated on each melody for its entirety. We regarded the responses in our experiment as reasonably satisfactory. The results of the subtractions, in terms of significant regions activated during each task, are given in the Tables and Figures. The regions activated during the familiarity task but not during the alteration-detecting task are listed in (Table 1, together with stereotaxic coordinates based on the brain atlas of Talairach and Tournoux.16 These results show areas of relative blood flow changes that emphasize differences between the 2 tasks and minimize the areas that are common to both. Significant increases of rCBF were found in the anterior portion of bilateral temporal lobes, posterior portion of superior temporal gyri, anterior and posterior portion of medial frontal lobes, bilateral cingulate gyri, bilateral parahippocampal gyri, left inferior frontal gyrus, and middle portion of the left superior temporal gyrus (Fig 1). The alteration-detecting task produced significantly greater activation bilaterally than the familiarity task in precunei, superior and inferior parietal lobules, anterolateral portion of frontal lobes, premotor areas, middle portion of cingulate gyrus, and the cerebellum Fig 2, (Table 2). Activation maps for the subtraction of the familiarity versus the alteration-detecting tasks. 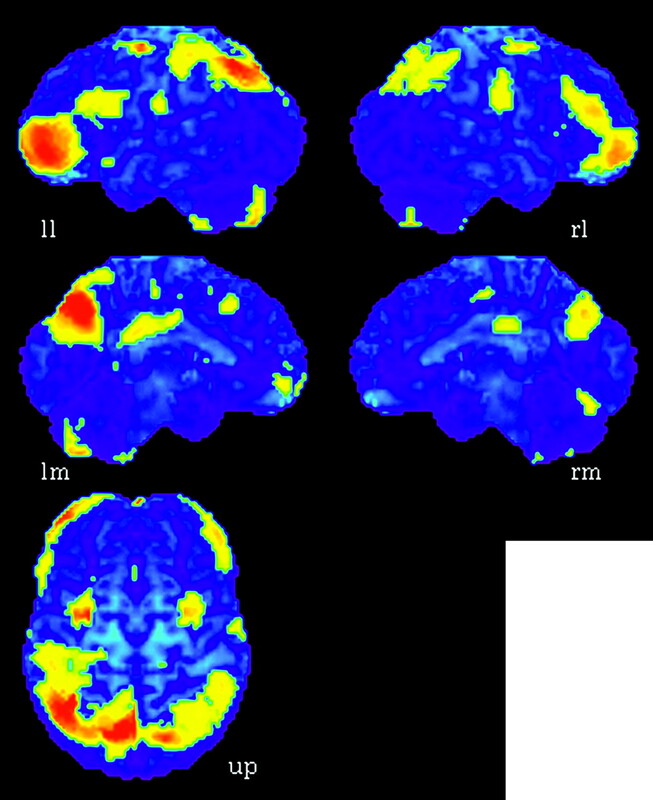 Areas of significant activation (P < .01) are superimposed onto the surface maps of the averaged MR imaging of the brains of 10 subjects. Anterior portion of bilateral temporal lobes, posterior portion of superior temporal gyri, anterior and posterior portion of medial frontal lobes, bilateral cingulated gyri, bilateral parahippocampal gyri, left inferior frontal gyrus, and middle portion of left superior temporal gyrus were remarkably activated. ll, lateral surface of left hemisphere; lm, medial surface of left hemisphere; rl, lateral surface of right hemisphere; rm, medial surface of right hemisphere; up, upper surface. The left side of the bottom-image shows the left side of the brain. Activation maps for the subtraction of the alteration-detecting versus familiarity tasks. 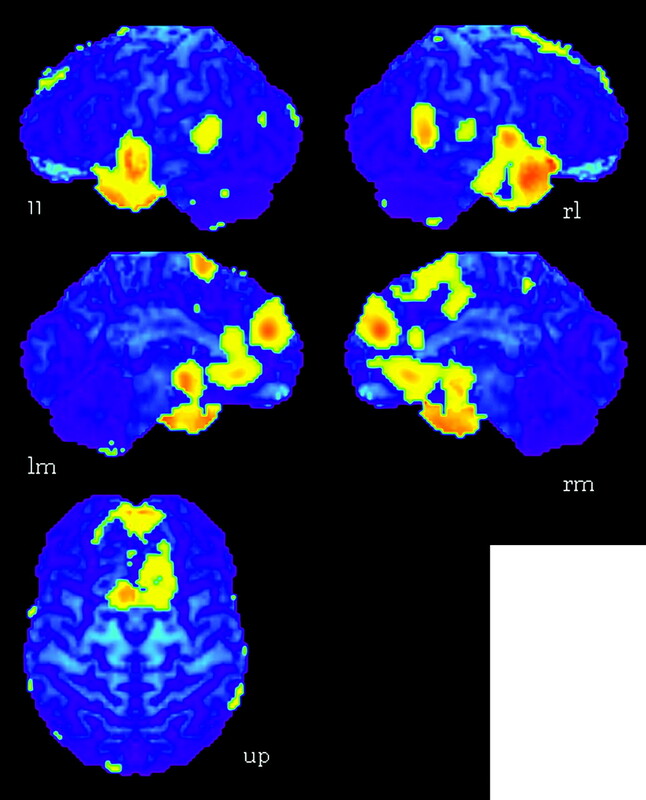 Areas of significant activation (P < .01) are superimposed onto the surface maps of the averaged MR imaging of the brains of 10 subjects. Precunei, superior and inferior parietal lobules, anterolateral portion of frontal lobes, premotor areas, middle portion of cingulated gyrus, and the cerebellum were bilaterally activated. ll, lateral surface of left hemisphere; lm, medial surface of left hemisphere; rl, lateral surface of right hemisphere; rm, medial surface of right hemisphere; up, upper surface. The left side of the bottom-image shows the left side of the brain. Our results are consistent with those in the report of amusical patients1 and also with several group studies. In an investigation of patients with temporal lobectomy for treatment of epilepsy, patients with right or left lobectomy revealed a deficit of melody recognition.17,18 Similar results were found by Ayotte et al19 who studied patients with right and left middle cerebral artery infarcts; both groups of patients showed impairment of the familiarity decision test for melodies. The results of reported group and case studies emphasized the functional importance of the anterior portion of temporal lobes for the recognition of familiar music,1,17,18 which is consistent with our present findings. We hypothesized that the retrieval of familiar melodies from the LTM and the generation of a melody-image participated in the familiarity task. The retrieval might be correlated with activation of the anterior portion of bilateral temporal lobes, and the melody image generation with activation of the middle portion of left superior temporal gyrus and medial frontal cortices. Both lesion and functional imaging studies have revealed that temporal poles are involved in the recognition of familiar objects,20,21 especially in their retrieval from the LTM.22 Here, temporal poles might also participate in the retrieval of familiar melodies from the LTM. The activation of superior temporal and frontal regions might participate in the formation of a musical image. Using PET, Halpern and Zatorre9 investigated the activated brain regions associated with auditory imagery for familiar tunes. Subjects were required to imagine the continuation of nonverbal tunes cued by their first few notes and to listen to a short tonal sequence as a control task. Subtraction of the activation in the control task from that in the real-tune imagery task revealed primarily right-sided activation in frontal and superior temporal regions and supplementary motor area (SMA). They concluded that areas of right auditory association cortex, together with bilateral frontal cortices, were implicated in imagery for familiar tunes. Several neuroimaging studies that used functional MR imaging23 and magnetoencephalography24 supported the opinion that frontal and temporal cortices participated in auditory imagery. Thus, the activation of superior temporal and frontal regions in the present study might be caused by the generation of image of familiar melodies. When we listen to familiar melodies, verbal and emotional processing might also occur. In the present study, activation was observed in the left superior temporal gyrus and inferior frontal gyrus. We believe that the cognition of linguistic information participated in listening to well-known songs, such as remembering their titles and lyrics. It is generally agreed that the parahippocampal gyrus participates in emotional responses.25 Blood et al10 reported, after their PET study, that CBF changes in the parahippocampal gyrus were correlated to affective responses to music. Brown et al26 clarified that, by using PET, passive music listening engaged limbic and paralimbic systems. Nursery songs often evoke nostalgic childhood memories, and because the familiarity task was easily performed compared with the alteration-detecting task, our subjects might have had time to enjoy listening to the musical material. Therefore, in the present study, it is possible that the parahippocampal gyrus was activated by these emotional responses. In the detection of altered notes of familiar melodies, musical stimuli might be persistently compared with the melody in the LTM: via the stages of the perception of auditory stimuli and the generation of a melody-image, the target melody in the LTM is retrieved, and each note compared with that of the melody-image. Subjects were required to listen to the entire melody. We assumed that most attention was focused on performance of the alteration-detecting task and that the subjects had little time for esthetic appreciation of the music. When subjects judge whether melodies are familiar to them, the following cognitive processing might function: the melodies in the LTM are retrieved and compared with represented musical stimuli. The anterior portion of temporal lobes and the interaction between the right superior temporal gyrus and SMA might participate in that retrieval and the generation of the melody-image, respectively. Linguistic information such as titles and lyrics may have a relationship with the activation of the left inferior frontal gyrus and left superior temporal gyrus. Parahippocampal gyri may be activated by emotional responses. To sum up, we propose that musical, linguistic, and emotional processing function in listening to familiar melodies. In the detection of altered notes in familiar melodies, brain regions contained in the precunei, superior and inferior parietal lobules, and frontal lobes were activated, which were similar to those activated in the task of concentrating on vocal parts of a harmony as found in our previous studies. We propose that these regions might be involved in pitch analysis.